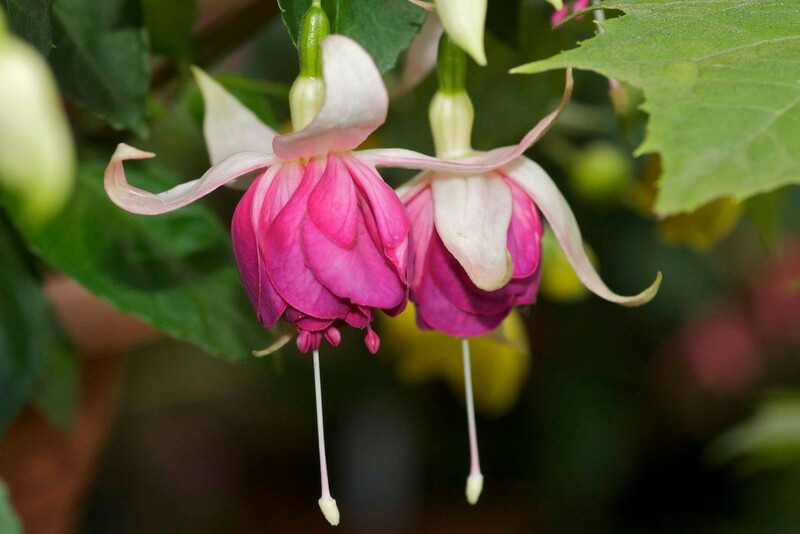 Fuchsias: Hobby, Passion or Spleen? Scince my childhood i am familiar with blooming plants, commonly known as flowers. The garden of my parents contained Roses, Rudbekias, Dahlias, Pelargonias ….. There were no Fuchsias, and i did not know them. When 20years old, i left home to attend the University of Heidelberg for study, met my beloved husband and moved into our first “real” apartment with balcony- on the north side. Looking for some flowers to brighten up that north balcony i was told somehow to look for fuchsias, these being the best for shady places. That my Fuchsias of these days had names beside being red, white, red-white ore upright or hanging, was not known to me, nor was i interested in it. They were just on that balcony, flourishing beatifully in astonishing difference, and with the first frost they were gone…looking forward to buying new ones the next year! The time after passing the exams we moved several times and had lots of work in our jobs, working regularly through night and weekends as well, and there was no spare time or even energy to be spent in grooming flowers. But, after settling finally down in our own house, we created our garden, utilizing only perennial plants such as Viburnum-variatons, Maple-Leaf japonica, Akeleas, Astilbes, Funkias, Phlox, Hortensias, Paeonias, Tulips and the like. Within the house i had, and still have, Orchids. Many years later- after passing the age of 40- i visited by chance and out of curiosity, having one day at my disposal, a marked-garden with more than 1400 different varieties of Fuchsias- the Fuchsienparadies (Fuchsia-Paradise) Fuhrmann in Augsburg/ Bavaria. And on this afternoon my “Mania” started! My car was packed with Fuchsias on my way home, and the next visit shortly after that, with my husband and a larger car. This continued for some more visits, and i was given plenty of information about Fuchsias and their care. My beloved husband keeps on telling that it is “my” hobby, but does admit, that he likes these “flowers”, and keeps on helping me often. And, referring to me, the word hobby is quite some understatement of Fuchsia-passion; some may call it a veritable spleen! Up to now i call more than 300 Fuchsias my own, suited for every location and in different sizes, old prejudices about proper locations are done with. And 2 years ago we built a greenhouse with heating, reducing the losses during the winter, but therefore foregoing a complete winter rest. By the way: i have got more hobbys: taking photographs (e.g. Fuchsias!) and traveling (visiting other gardeners and marked-gardens as well!). I want to share my “spleen” with other people and enthusiasts, who take interest in the beauty of the world of plants, espacially with younger people, since i do reject the prejudice, Fuchsias are only plants for the elderly, from my own experience. This is what this Blog is made for, and i am really looking forward to each reader and to comments!